Just last week, Madonna didn’t hold back in an amazing installment of “Carpool Karaoke”, but at the Billboard Women in Music Awards on Friday, the iconic singer got real in whole other way in her acceptance speech for the honor of Woman of the Year. If her inspirational words weren’t enough, Madge also wore an outfit that perfectly mirrored the points about feminism made her in speech. She showed off a custom suit by Gucci’s Alessandro Michele that featured a ton of stunning embroidery, plus most significantly, a panel across her back with the word “Euterpe” emblazoned in red. In Greek mythology, Euterpe is the name of the muse of music. 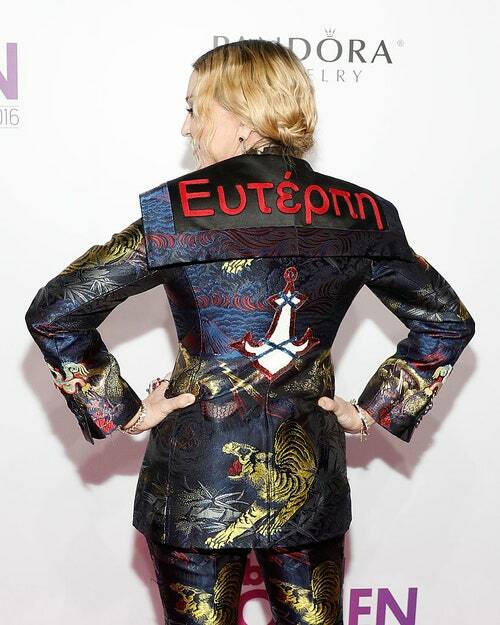 As the Woman of the Year at a major music event—and as W points out, one totally in control of her own image (literally wearing a custom-made outfit)—Madonna proves she’s owning her own myth.